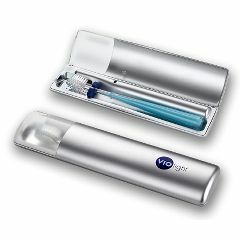 The Violight Personal/Travel Toothbrush Sanitizer uses our germ-eliminating UV technology in a sleek, go-anywhere package. 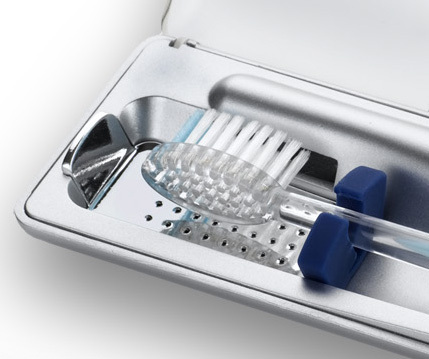 The germicidal light activates as soon as you close the lid, and in 6 minutes your toothbrush is sanitized and safely stored until you're ready to brush again. The Violight Personal/Travel Sanitizer has a deluxe metallic finish, long battery life, and includes a removable drip-tray for easy cleaning. Perfect for you or as a gift of health --- whether it stays at home, goes to the office, gym, or on a trip. Weighs just 6.5 oz. with batteries. is there a picture of where the batteries go in?